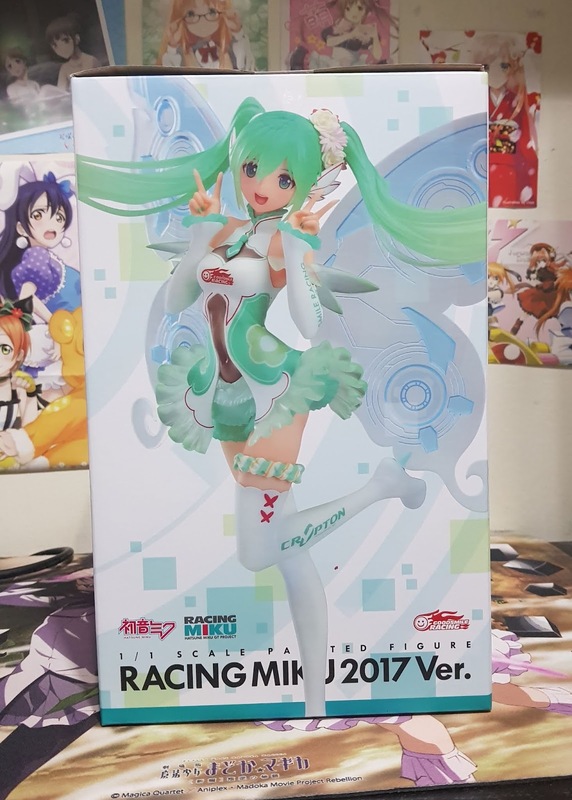 The Racing Miku 2017 version is illustrated by Tony, and the concept is a 'digitalized' fairy. She has bright green hair and matching frills as a skirt, and transparent wings with digitalized print. 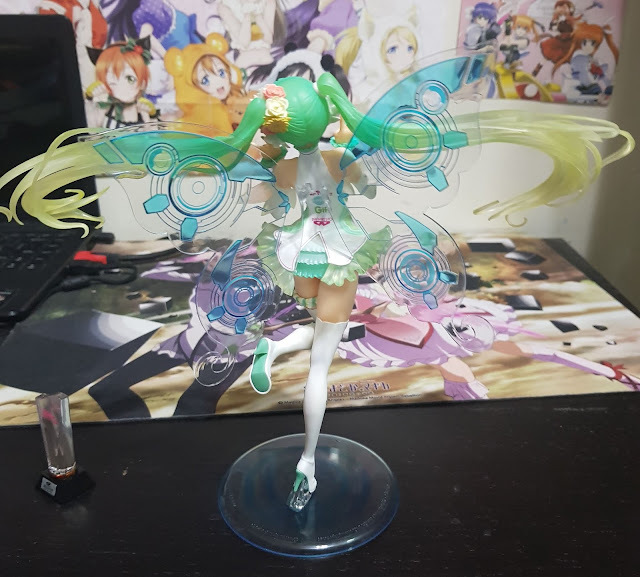 Furthermore, she comes with various intricate parts such as wing-shaped ear covers and a flower hair tie. Her box comes with a large window and comes in a sturdy blister that holds the wings in a separate blister from the rest of the figure. 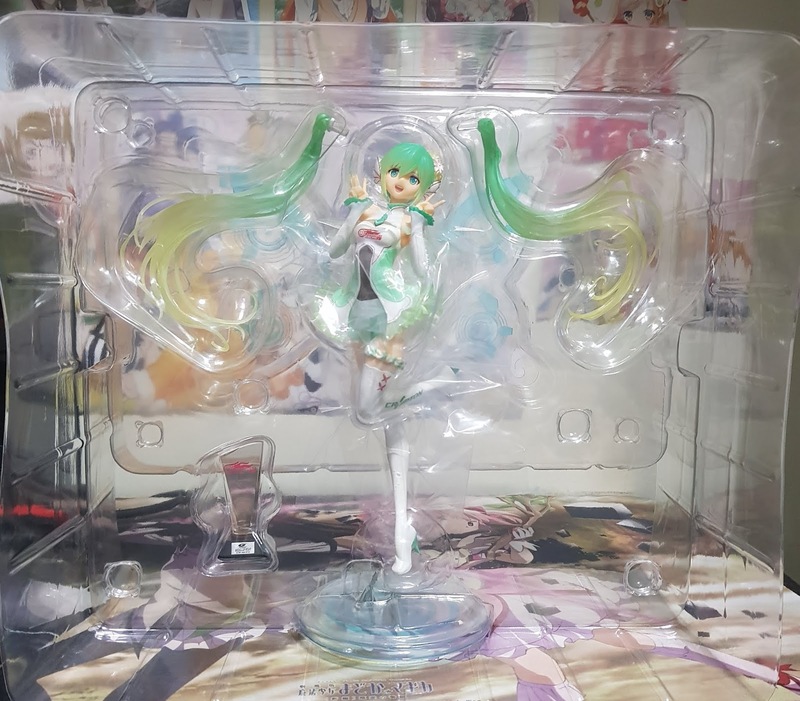 However, do note that the box itself isn't as sturdy as I thought it would be, and she is actually only shipped via EMS (she doesn't fit into SAL dimensions. 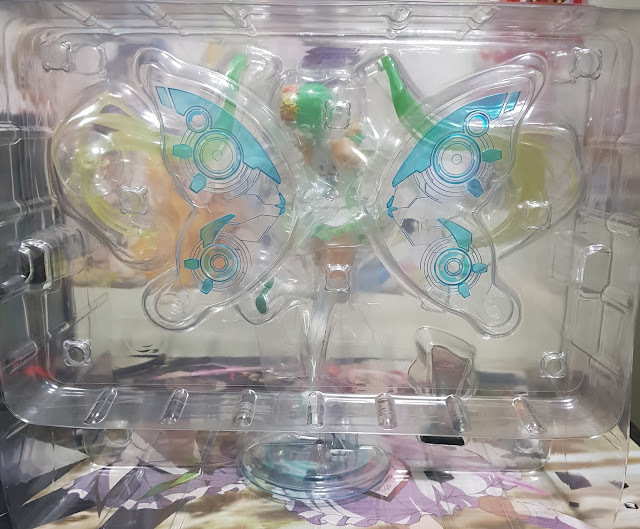 The other sides of her box shows the figure in other angles. Only one side displays an illustration of Fairy Miku. 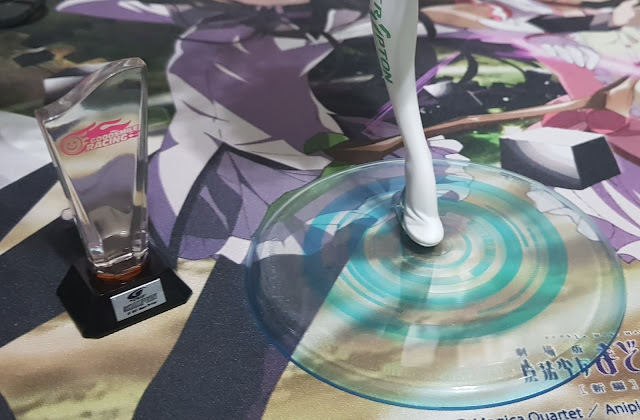 However, I noticed that there are some differences between the printed image of the prototype and my copy of her. For instance, her skin looks a lot tanner on the image than the figure. 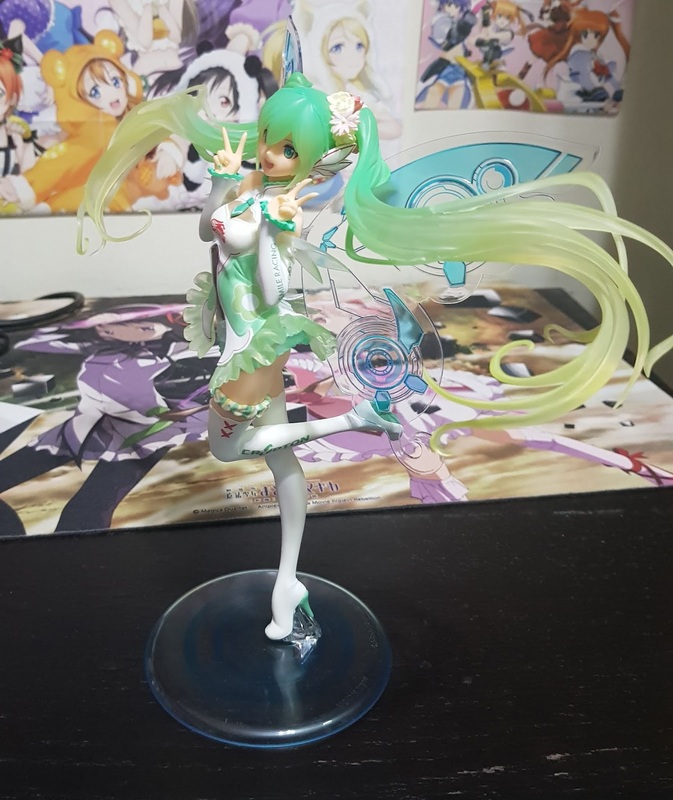 The green accents on the figure, especially the darker gradient of her hair, is less saturated on the figure than in the illustration. 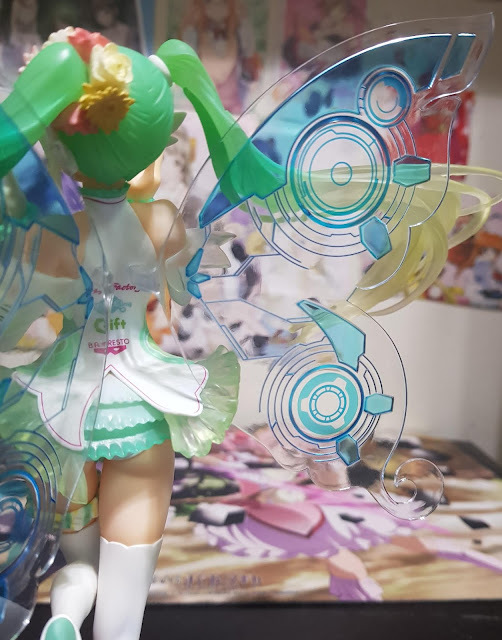 Lastly, the wings are a lot more transparent on the figure than in the illustration, where they seem to be tinted blue. As mentioned earlier, the wings are packed in a second blister layer. 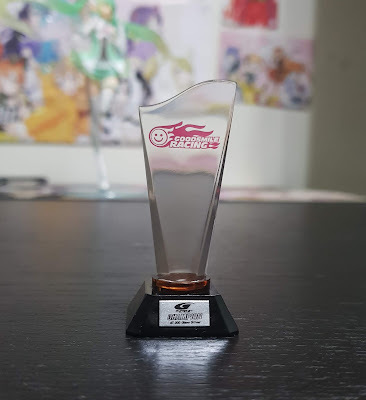 She also comes with a trophy, which is sculpted after the winning trophy GSC got at the race itself! Unfortunately, my copy came with some defects in her both her left and right ponytails. I have emailed GSC about it, but they refused to send a replacement part due to them not seeing it as a problem. I have since then placed the figure far above eye level so the defects wouldn't be as visible when my room light hits the figure's ponytails. 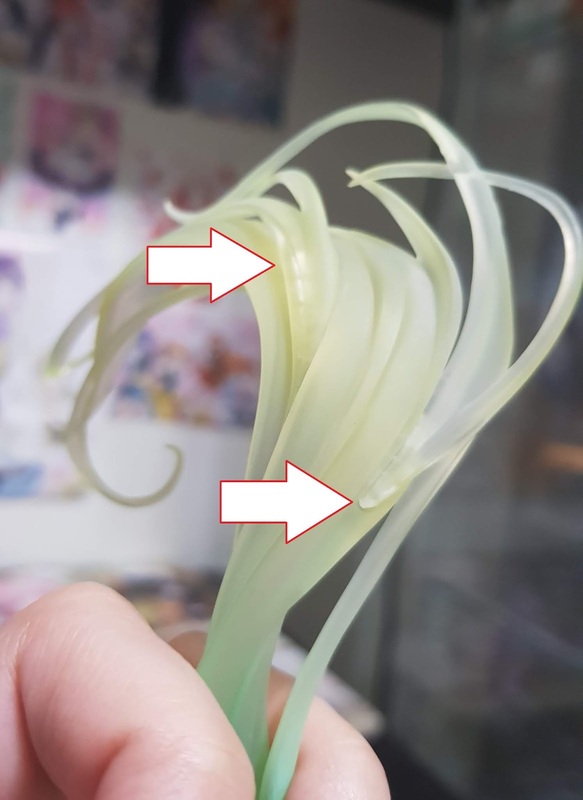 First, on her left ponytail, I recognize that there are very obvious glue spills, making the branching of new strands very noticeable (bottom arrow). 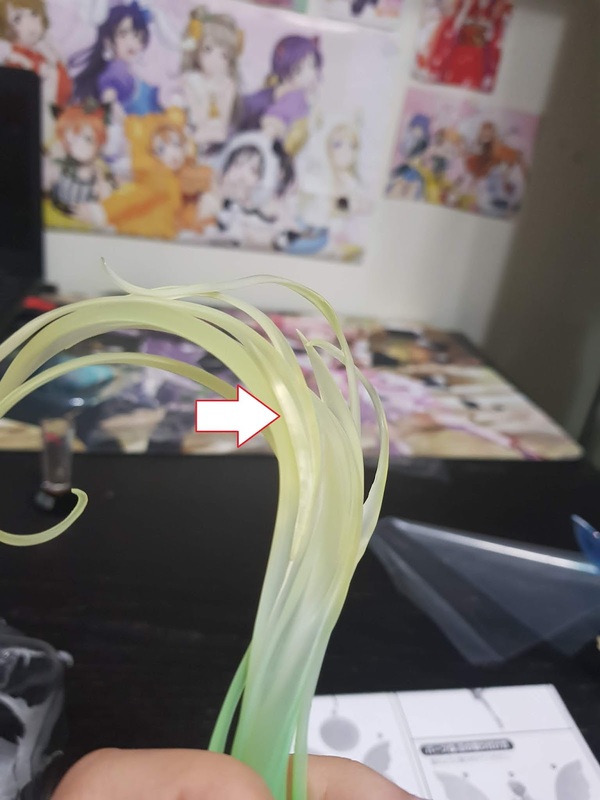 When matched with the lighter gradient in her ponytail, it creates this opaque white layer that is glaringly noticeable from the front. What makes this worse is highlighted by the arrow above and is illustrated better with the picture below. It creates this whole line of white in the middle of the hair part that stands out so terribly against the lighter gradient! Her left ponytail meets a similar problem with this white band at the darker green of her ponytails, creating this 'break' in color, that just looks so hideous. It stands out terribly when you are admiring the gradient and the flow of her hair. Putting those defects aside (that I hope are only on my copy), we'll take a look at the whole figure itself. You'll see that the greens are a lot less muted than on the box itself. The flow of her hair also makes her take up a lot of horizontal space, although her base is really compact in comparison. She also looks a little strange from certain angles, but this can be overlooked, as these are not the angles which she should be viewed at. 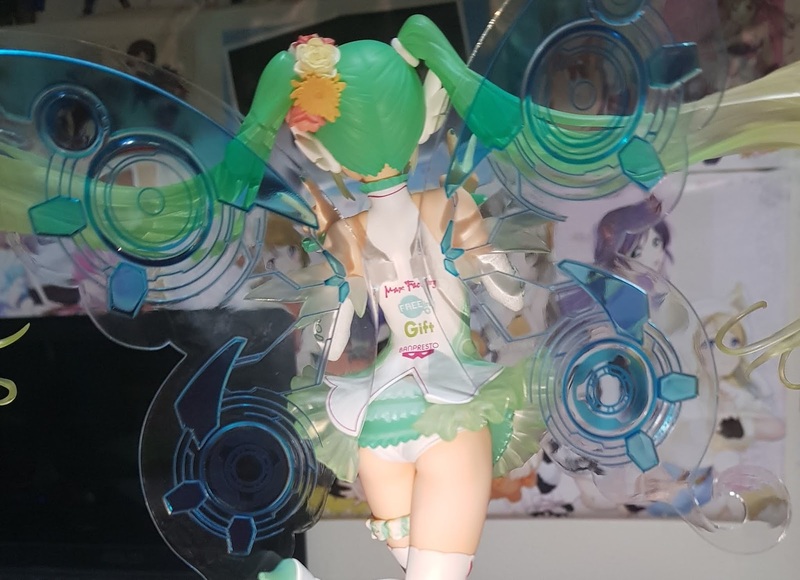 I find that my favorite angle to view this Miku figure in is from the back. 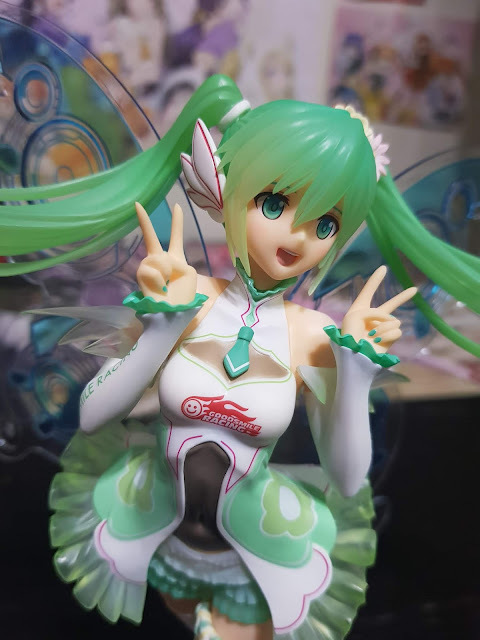 While I appreciate her wings and the sculpt for her hair, I don't really like how they did the face (which is really similar to Tony's art style). 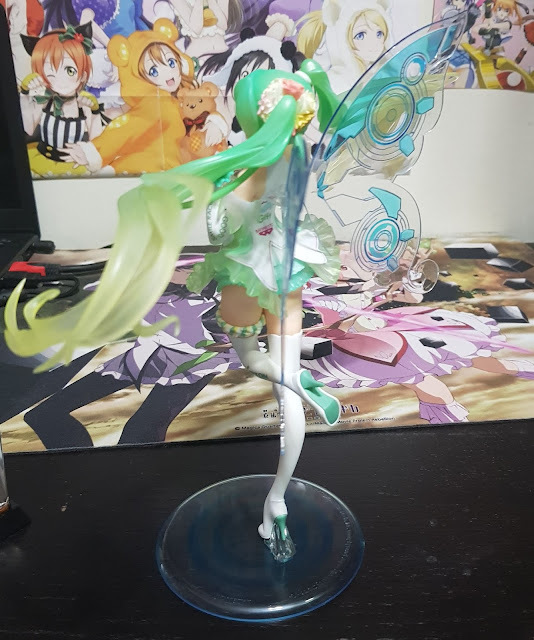 She really seems to be lightly dancing and skipping around when you view her from different angles! 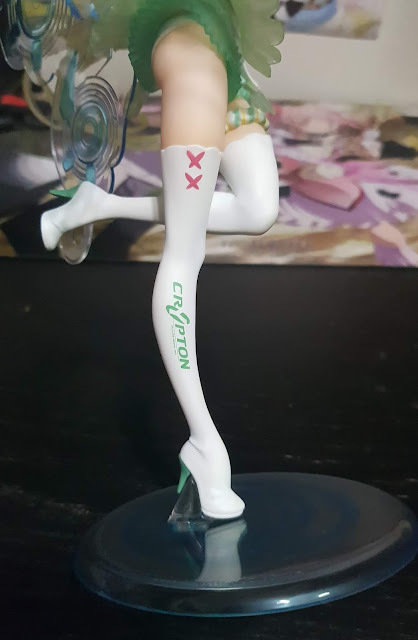 Something that I love about this figure is how delicate the sculpt is. 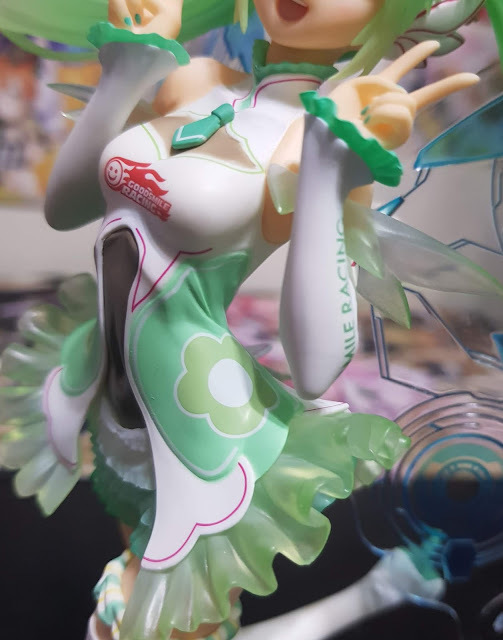 There are so many little details to look at here, such as the thin red lines around the front of her outfit, the small tie, the sculpt of the bottom of her ribs and bellybutton. There are also so many translucent parts, such as those around her shoulders and the outer dress part around her hips. 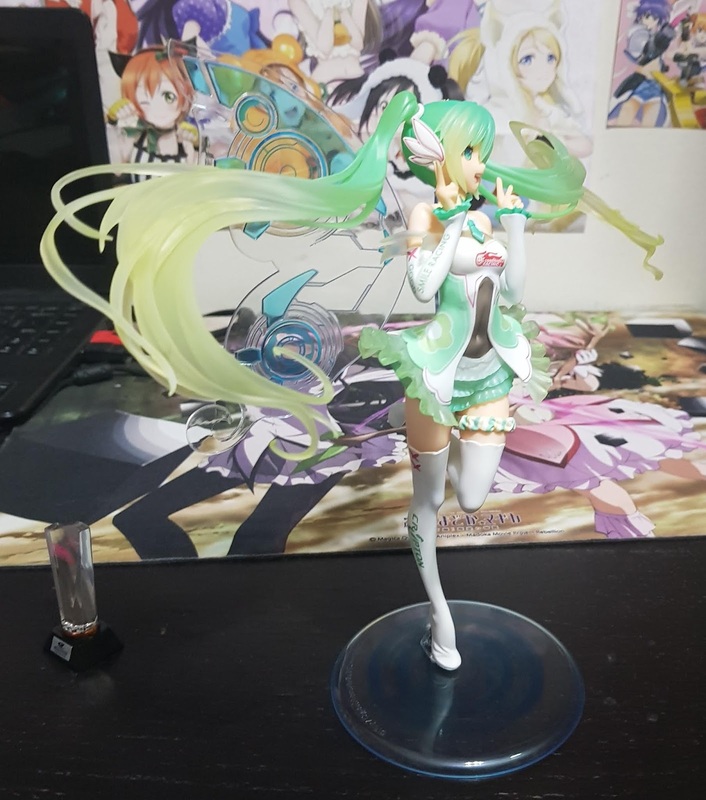 What I don't like about this figure is the painting. I felt that it could have added so much more rather than just using different shades of green. There should be a lot more shading involved as well. Focusing on the good point of this figure (the sculpt), we see a lot of details in the sculpting. While I don't dig how angled her ribs appear, I'm sure there are quite a few people out there that would dig it. 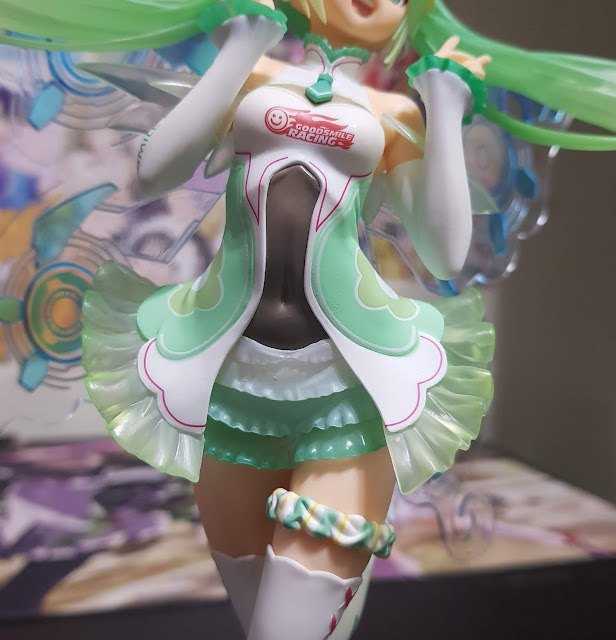 Also, there are creases around her hips and the scrunchy around her tie shows really good sculpting details that displays how soft it looks. I love her thigh-high boots and the little feminine details on it. For instance, the cute pattern at the hem of her boots and the soft pink painting on either side of it, that resembles small butterflies. The logo there is also a good way to add in color to the white boots, and her green heels help to tie the color scheme back to the mainly green figure. 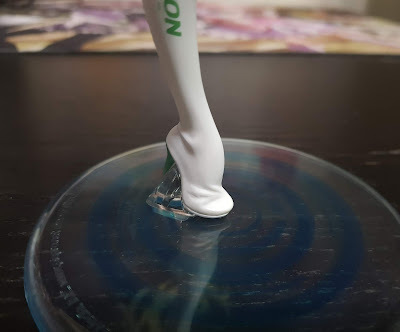 Although there are adequate creases on the boot, the shape of her foot itself is rather strange, and I'm pretty sure it would hurt terribly if she were to pose it at this angle. Other than the lack of shading for the boots, another point that throws me off is the lack of any patterning at her soles, which are raised in the air. Adding some detailing here would have done wonders to my rating of this figure. 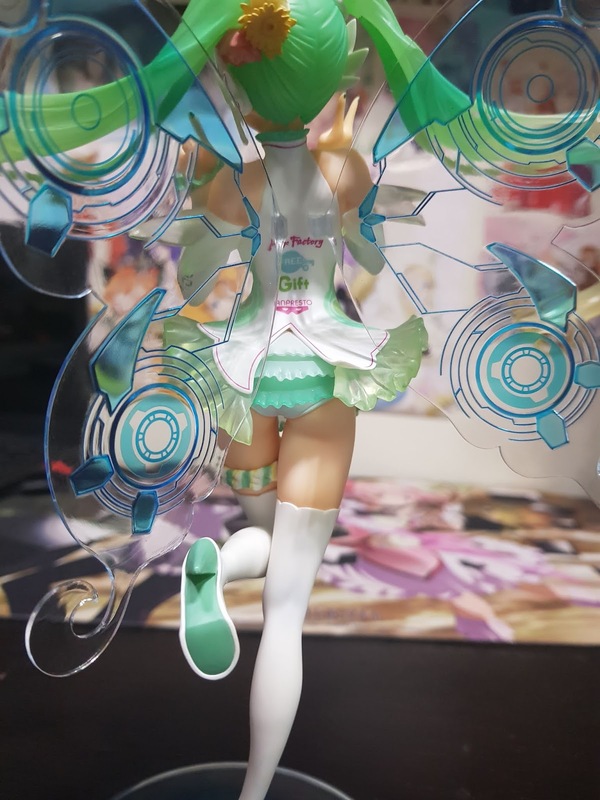 Assembling Miku means inserting her wings into place. 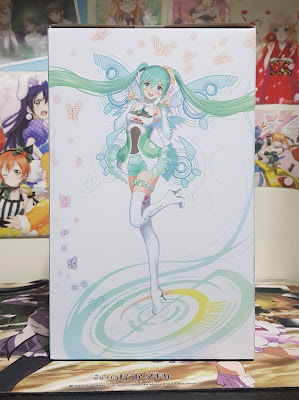 Unfortunately, no detailed instruction was given and one was left to figure out how to position her right wing based on the illustration on the box itself, which goes in between sections of her dress. Thankfully, the left wing is easy to figure out. The pattern on her wings is reminiscent of a futuristic design and it's so pretty. 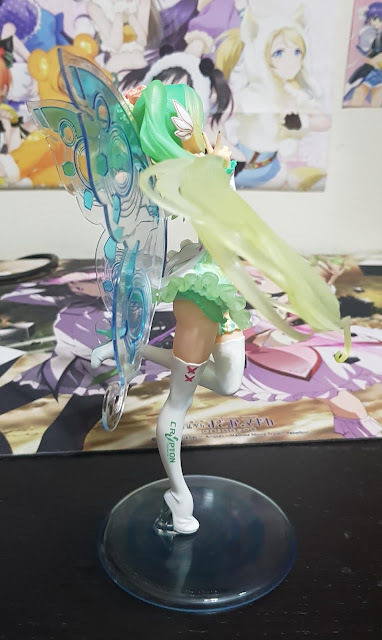 I do think that the transparency of the wings made it look a lot better than with the blue tint shown in the image. I would have preferred if they could line the perimeter of the wings so the unique shape would stand out more. 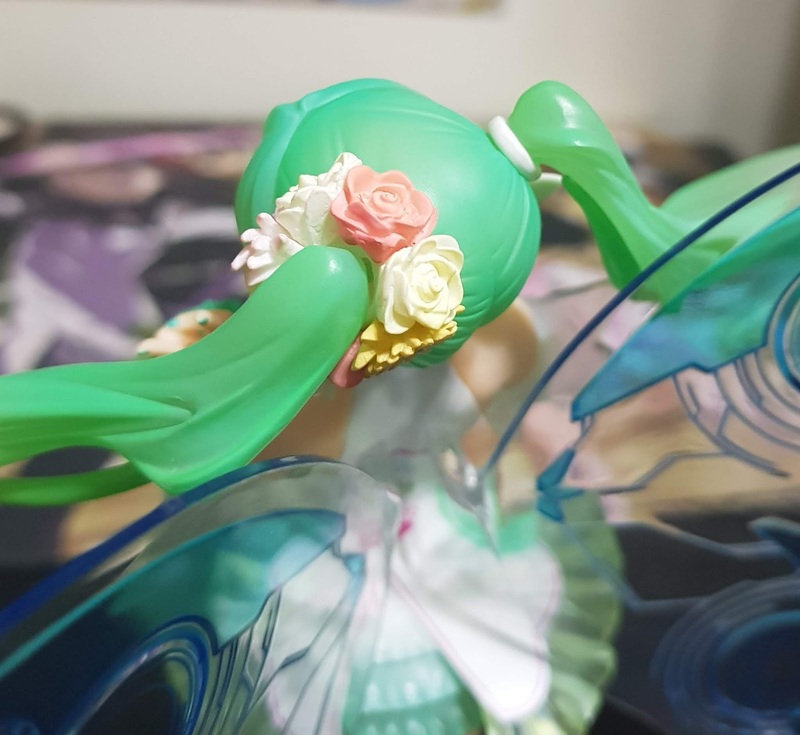 I love her hair tie a lot, and you can see the effort that went into sculpting details of the different flowers on the figure. The pastel colors used really adds a different color dimension to the figure and helps the palette stay soft and cute. I wish the rest of the figure could replicate the same feel without using such a saturated green. 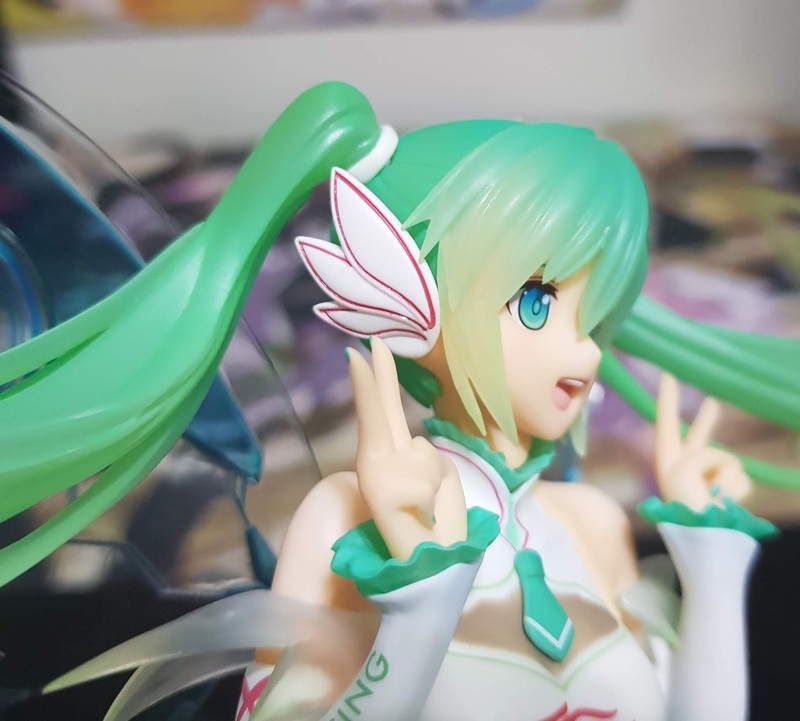 Her ear covers are lined with red, and are painted without a single error. As usual, a little more shading would have done wonders on this accessory as well. 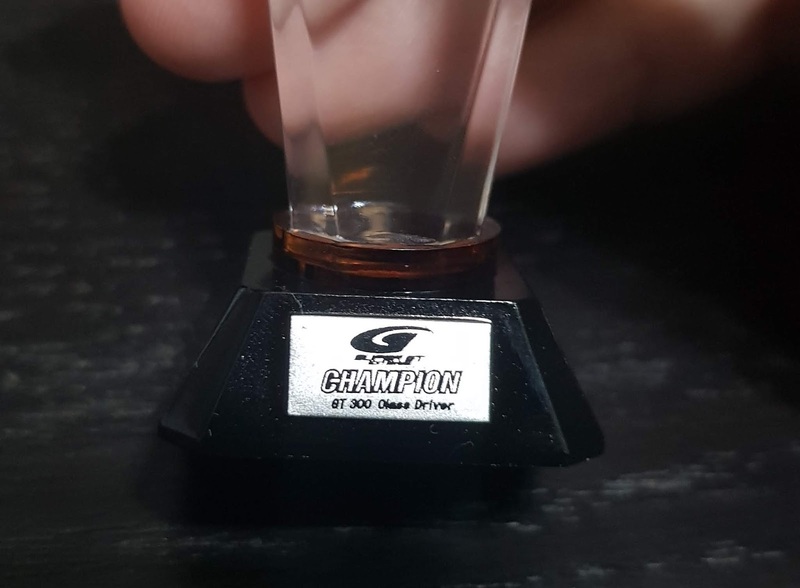 Last but not the least, the base and trophy. I love how compact the base is. While it is unfortunate that they did not choose to go with a small diorama to enhance the figure, I love that they chose a compact base when they decided to use a plain one. 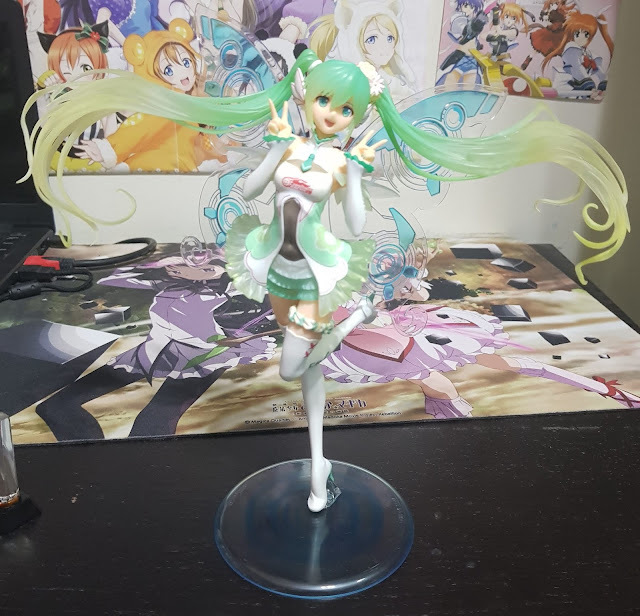 It makes it a lot easier to fit other figures around it as well, so this is definitely a plus point for me. Furthermore, the light blue circular pattern also helps draw attention to the middle of it, the figure. The trophy is simply made, but really looks quite authentic. 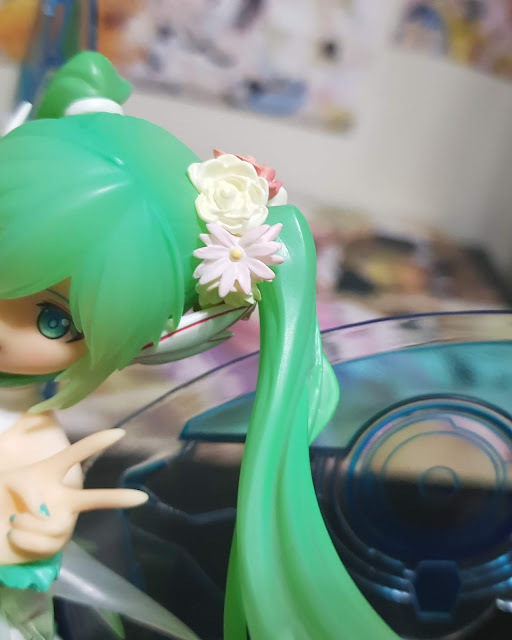 There's not much here to be said as it is not attached to the figure or base in any way, you can simply pose the trophy next to Miku or choose not to. Do note that the trophy does appear quite huge beside Miku, but she's a fairy in a 1/1 scale so I guess it fits the scale. I love the attention to the sculpting that they have done for this figure, however all in all, the painting seems to be a little lackluster. There is a little too much green going on in this figure, and while I understand that they wanted to follow Tony's illustration, there are times when colors in 2D illustrations don't fit well on a 3D figure. The color scheme and absurd lack of shading makes her colors appear rather flat to me. 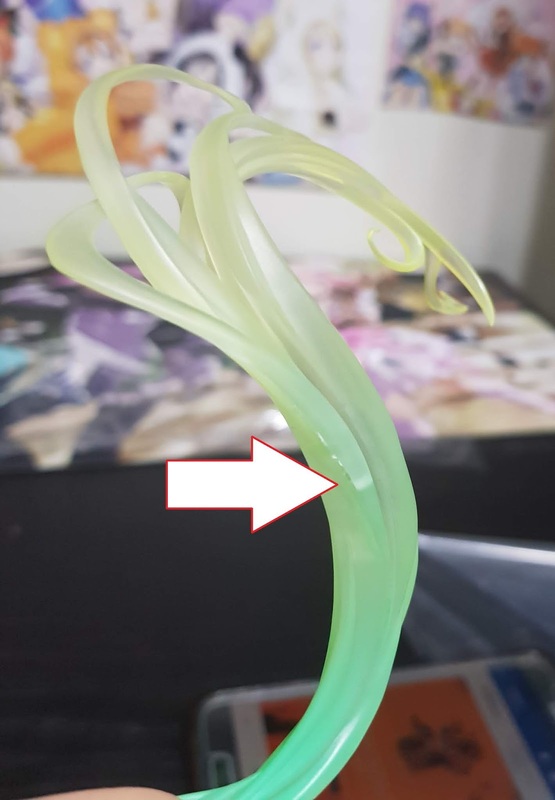 My copy also came with flaws that I felt were serious and jarring, and impeded with my liking for this figure, but were not recognized by Good Smile Company. 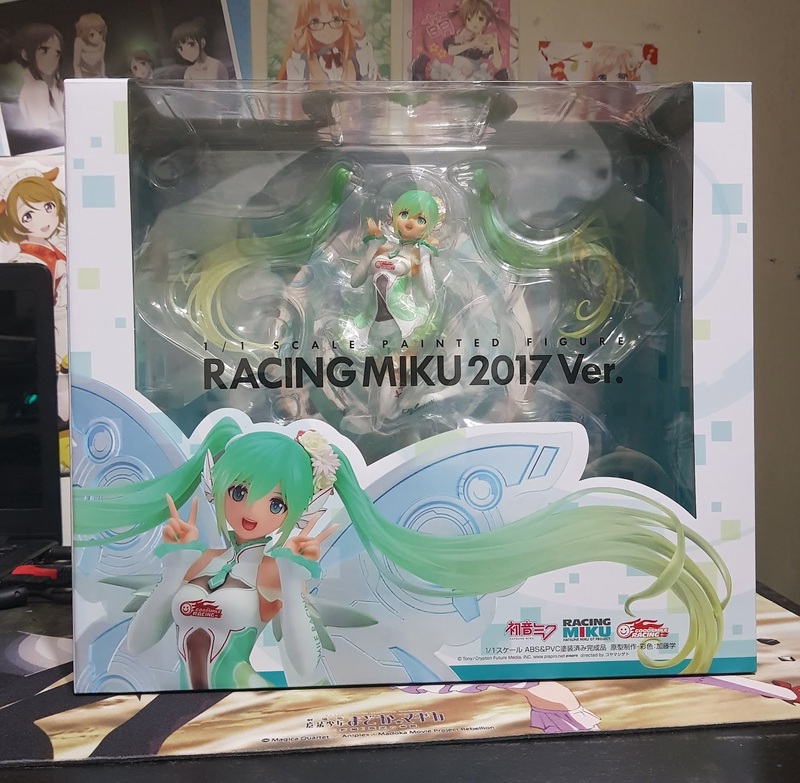 If you feel like getting the Racing Miku 2017, I would suggest getting the Nendoroid which is a lot cuter than this. 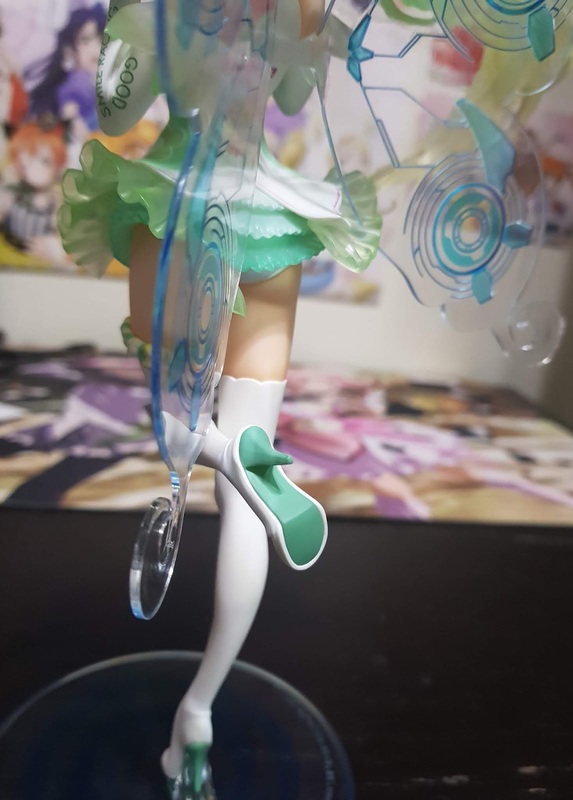 If you are more of a scale figure person, I would recommend getting Aquamarine's version, which has a more dynamic pose compared to GSC's version in the promotional photos. However, do note that I did not get Aquamarine version as I had already ordered this, so take my comparison of this to Aquamarine's quality with a pinch of salt. 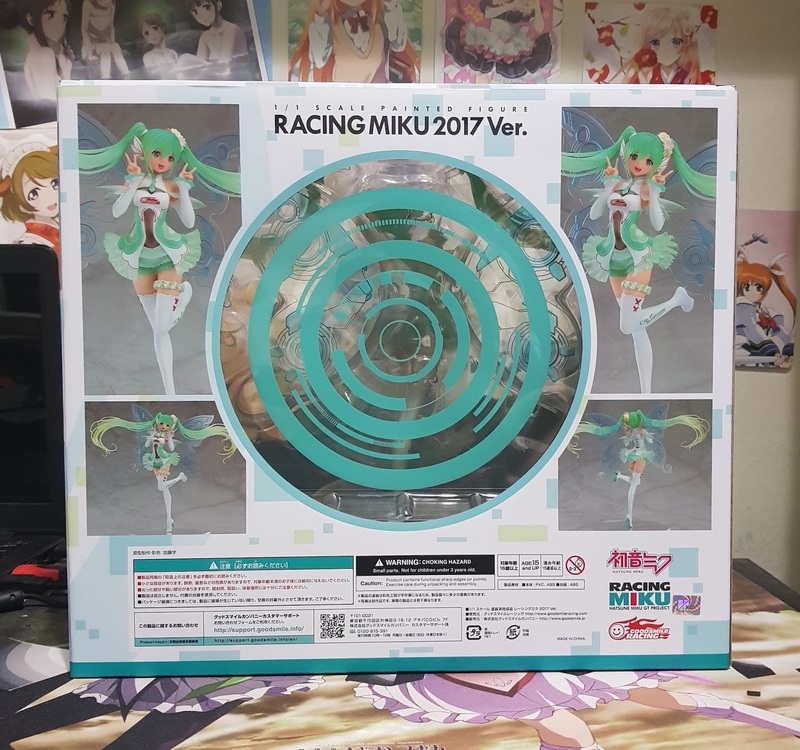 No Comment to " Figure Unboxing and Review: Racing Miku 2017 - Tony's Fairy Miku 1/1 scale (Good Smile Company) "